With Molly Murphy's wedding to NYPD Captain Daniel Sullivan quickly approaching, the Irish P.I. heads to the Westchester County countryside, where Daniel's mother can counsel her on a bride's proper place. Surprisingly, Molly seems to be agreeing with her future mother-in-law's advice. Molly promises to leave her detective work behind and settle down after becoming Daniel's wife...but she isn't married yet. So when she gets word of a possible case, Molly sneaks back into the city to squeeze in a little more sleuthing before the wedding bells can ring. A wealthy Chinese immigrant wants Molly to find his missing bride. Molly has a hunch that his intended has run off. But where could she have gone--and where would she be? The only Chinese women of the era are kept under house arrest, and Molly can't help but wonder whether she's saving the bride-to-be from the streets...or helping to lock her away for good. 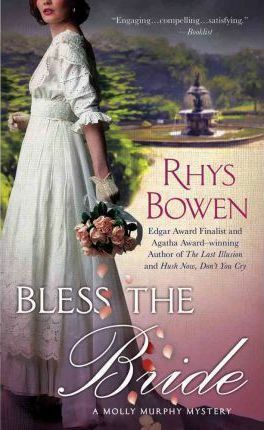 Rhys Bowen's novels have received a remarkable number of distinctions, including the Anthony, Agatha, and Macavity Awards as well as the Bruce Alexander Historical Award and the Herodotus Award. She is also the author of the Royal Spyness series and the Edgar Award-nominated Constable Evans mysteries. Born in England, she now lives in San Rafael, California, with her husband.